Although G.K. Chesterton (1874-1936) is often known for his wit, a characteristic that earned him the nickname Prince of Paradox, it would do a disservice to the prolific writer to mention just one aspect of his work. In fact, Chesterton is still read heavily in subject matter as diverse as philosophy, ontology, poetry, journalism, biographies, and mysteries. In addition to writing for papers, Chesterton wrote dozens of books, hundreds of poems and short stories, some plays, and thousands of essays in his 62 years of life. He produced seminal religious works such as Orthodoxy, as well as the biographical Charles Dickens: A Critical Study. 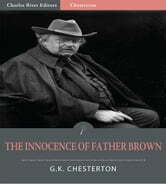 This edition of Chestertons The Innocence of Father Brown is specially formatted with a Table of Contents and is illustrated with over a dozen pictures of Chesterton.